The main objective of this stage is to help the children make experiences in life and the courses of the study. The evaluation is done through CCE i.e. Continuous & Comprehensive Evaluation. It consists of cycle tests, programmed curricular activities and projects to assess children holistically which are conducted time to time. This makes the child constantly alert about his performance without any laxity. We aim to prepare our children to be healthy and active with a passion for developing their physical abilities and to achieve high standards and high levels of attainment in academics, and extra curricular activities. We understand the importance of competitions for the children especially as they progress and develop through the school. For this reason, all the students are divided into four clubs and four houses and they are given opportunities to compete in Inter-house Competitions, in a wide variety of sports, debates, dances and music, art, dramatics etc. Every child has the opportunity to compete in Inter-house Competitions against other children in the school. It is important that as our children grow and develop into the future besides understand the important role that competitions have for them in developing and maintaining their health and well being. 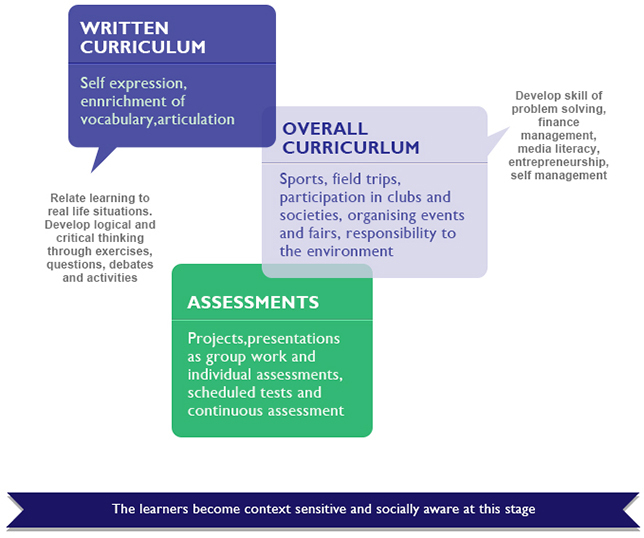 The learner is equipped with ‘learning skills’ and is ready to move on to the Secondary School program.